When WordPress 2.7 and its new and optimized user interface came, I thought there was still room for improvements: a horizontal menu gave the admin area more of a "desktop application" feel, and I think it's superior to a vertical menu. So I updated the WordPress Admin Drop Down Menu. Activate and enjoy. Another friendly install & forget piece of PHP. The plugin has been developed on Firefox 3, Chrome and MSIE7. It should do fine with MSIE6 and Safari too. The plugin comes with a wickedly cool API that will allow other plugin developers to interact with it, like adding your own custom icon for your plugin. Read the API for Coders page for examples and documentation. Also, all elements the plugin produces get custom CSS classes and id's to allow easy styling or selecting. The plugin is ready for interglobanalization and there is a .pot template file included so polyglots can even make their own translation and sent the .mo and .po files to me that I'll include in the package. All my plugins are designed to run on the latest WordPress version available. Upgrade WordPress whenever a new version is out, or be sorry when your site gets compromised. If for some unintelligent reason you need to get an older version of this plugin, it might be available, yet totally unsupported or recommended. Check here: Other versions. Sure. Feed me back. Like it? Blog about it. Love it? Click on the download link, see the Paypal button appear, and give it some clicks! If you're reporting bugs, you're welcome, but please provide a screenshot and informations about your browser & your OS. I'm not supporting deprecated blogs or plugins or browsers, and I can't respond to incomplete bug reports. If you're suggesting a feature, you're welcome too, but I won't add an admin menu on the public side of the blog, on top of pages. If you're looking after having this menu fixed on top of page, check this companion plugin that works as a plugin to this plugin: Admin Menus Fixed. This is one plugin I've grown to love – its 100% better than the default set up. But….I've had to increase the security of my blog, and put an htaccess file into wp-content. That doesn't work. If I delete the htaccess file the menu works fine again. Could you tell me what I need to add to the htaccess file to make it compatible with the menu? However, same problem as Rakshit (21/Apr/10): "In Google chrome it shows menu in horizontal way. for e.g. setting tab, it shows long horizontal menu. So we need to scroll horizontally for looking at all pages. I have added two styles in "ozhmenu li ul" class which resolve this problem." Looking for those two styles, and also for integration into a future update. Love the plugin…but having a problem, and only with upgrading. I'm running several blogs on my site, all up the 2.9.2 WP, but some have different plugin sets. My main site, and a few others, will not update thru WP plugin update, or Tools>upgrade functions. When I attempt to (and not update by FTP), the plugin upgrade brings me to my site's 404 page. Any idea why this might be? I've noticed this for the last few weeks. Otherwise, when I setup a new blog site, your plugin is always the first I activate, because it frees up so much screen space to give me some elbow room. Thanks for any comments back. I absolutely LOVE this plugin, however the last two updates have broken the admin backside of the wordpress site. I also get error on upgrading. I appreciate that your latest version is for WP3 but I simply activated the auto upgrade on WP2.9 and it upgraded to the latest. Is there anyway you can either stop this or release it as a seperate plugin as most people won't bother to read that it is v3 only and their admin will break when the auto upgrade. Alex » Yeah I thought WP 3.0 would be out sooner (this wednesday). I've added a check in the plugin to prevent activation on earlier versions of WP. Any suggestions on the least painful way to try to fix this would be appreciated! Keith Conover » Delete and reinstall the plugin from the repository. I've fixed this. Or, better, upgrade WP. CarpetGuy » Must be some left over code I forgot there. Weird, I've never seen this rendered on the screen. I've remove them in the plugin, re-get it. Upgraded to WordPress 3.0. today, unfortunately the drop down menu is not working. I even downloaded the plug-in again and re-installed but no luck. It shows up as a horizontal line instead of vertical. Lori » there's a test file in the /inc directory. Load it in your browser for a check & explanation of what fails. 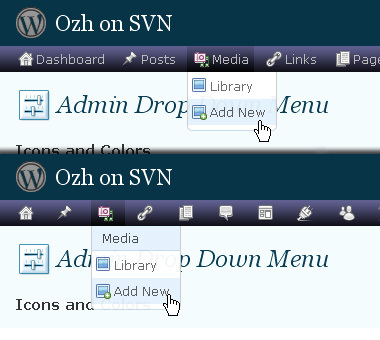 Just upgraded to WP 3.0, and the latest Ozh Admin Menu which is supposed to work with WP 3.0. The menu is broken, however. It just appears as a vertical list. Probably a CSS issue, but it's the same in both Firefox 3.6.3 and Chrome 5.0 (mac). Ray that is exactly what it is doing for me also. In fact, I just noticed that my admin area is displaying both the "standard" menu AND the vertical Ozh menu. So apparently, the Ozh menu is not replacing the standard admin menu. Like you, Lori. I uninstalled and reinstalled, and still have the problem. Good to know I'm not the only one experiencing the problem. Having the same problem as Lori and Ray … suffering withdrawal symptoms. Ray Gulick, same problem here !!! Same here but I have done a few tests. On a straight upgrade or install to v3, the plugin works as normal. On a multi site install, the plugin fails. Mine is not a multisite install, still fails. It appears to me to have something to do with the reference to the stylesheet in the header. On a text page, if I remove all the garbage following "adminmenu.css.php", things seem to drop into place. 1. from the plugins editor, select "ozh-admin-drop-down-menu/inc/core.php"
3. delete "?query" and save the file. As I noted, this will remove your ability to apply any settings to the admin menu, but it allows you to use it. Forgot to add, I am running wp 3.0, a slew of other plugins, and my own custom made them (created with Artisteer). Would that make ANY difference? 3. Activate it (viola!). 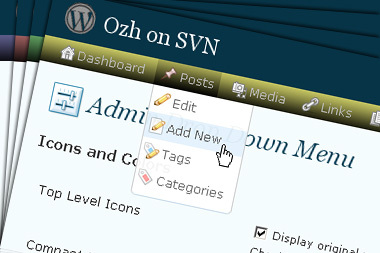 You should have the Ozh Admin Menu you've grown to love. Rich, it sounds like you have some odd issues going on. I would suggest deactivating all plugins and reactivating one at a time to see if you can isolate a conflict. Your theme should not affect your admin area. I'm running a LOT of plugins, but using WP Super Cache, and the page load times are fine (under 3 seconds). Had to deactivate ALL of them…last one being Ozh' Absolute Comments . Trying to deactivate THAT one early in this process caused a 404 as well, until it was the last plugin to deactivate. Strange. So, deleted Admin menu folder, deactivated ALL plugins (I'll just say "over 100"), uploaded 3.3.11, activated it, UPGRADED IT to 3.4, using the auto upgrade feature, and Voilà…success. Reactivated MOST of the rest of the "recently active" plugins, and now Ozh menus are working PERFECTLY. I had thought about turning off ALL plugins days ago, but it was late, and I just didn't need it that bad. Now that it's done, I seem to remember having to do that a few plugin versions back for Admin Menu. Anyway, thanks to you Ray, and most especially to you, Ozh…this IS my favorite WP plugin of ALL I've used. Been hacking WP since 1.3 something or other…2005 at least. Having the same problem Ray is seeing. Unfortunately, re-upgrading from 3.3.1 to 3.4.1 didn't solve the problem. (1) another plugin might be conflicting. So I disabled all but Drop-Down Menu. No joy. (2) A .htaccess entry might be causing a problem. So I removed my .htaccess file (it's now a 0-byte file). Again, no joy. (3) My hosting provider might be blocking php execution in some WordPress folders (e.g., /wp-content/ or /wp-content/plugins/). Filed a service report with my host (Arvixe.com) who promptly verified they do no php blocking at all. I'm using the Thesis premium theme for WordPress, but it has never, ever conflicted with a plugin before this. However, is anyone else having this issue also using Thesis? Ray it worked for me. Thanks a bunch! So this is interesting: I had an opportunity to do a new installation of WP this morning and, of course, installed WP3.0. I then added Ozh Admin Menu 3.4.1 (the one that has not been playing nicely with WP3.0 for me and others here) via the "add plugins" function in the admin area. It works fine. Is it possible it's only a problem on sites that have been upgraded to 3.0 while Ozh Admin Menu is activated? Well for me Ray, I have two sites and what is funny is it did not work on the one where I deactivated all the plug-ins. ON the second site I just kept the plug-ins active and they all worked (including Ozh Admin Menu 3.4.1. Go figure. I've tried each suggested solution; unfortunately, nothing has worked. The only thing I have not tried is to upgrade to WordPress 3.0 (again) after removing Ozh Admin Menu. Not even sure HOW to do that, though, since 3.0 is active on my site now. Steve – So, going back to Ozh v.3.3.11 and using that (not upgrading to most recent Ozh menu) didn't work for you? Ray – Sadly, no. I just did it once more, after completely removing the Ozh Admin Menu folder. I get the same vertical menu listing that I get with 3.4.1. Starting to think a virgin WP install may be my only hope…and really not looking forward to doing that. I supposed I could simply remove all my WP files then treat it as a new installation…but I really REALLY like the control of a semi-automated installation process. Sam – Did you try accessing your plugins folder via FTP and dragging the ozh-admin-drop-down-menu folder to the trash? In certain versions of IE(even different builds of v7, for example), I seen the vertical menu instead of the correct horizontal display. I've seen in both v6 and v7. Using FireFox or Chrome, the admin menu displays correctly. Try switching browsers to see if that makes a difference. Rich – I use Chrome exclusively (and I'm on a Mac, as well). I was able to resolve the issue by uninstalling WP 3.0, reinstalling it, and installing Ozh Admin Menu as my first add-on. Now, everything is peachy. Just very strange that it would take such drastic measures on a pretty vanilla installation.